First Class BBS for Obsolyte! 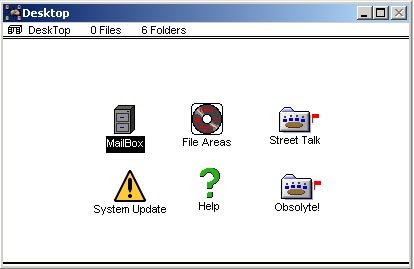 "First Class" is a client-server application that has Bulletin-Board-like capabilities and as such is used often (or at least, used to be used often) as BBS's for Macintosh support groups and for other purposes. It allows you to use your mouse "online" to access messages and files and provides all sorts of nifty things like integrated chat while provding a nice encrypted proprietary protocol for doing many tasks simultaneously -- so you can be uploading, downloading, chatting and sending messages all at the same time. Unfortunately; clients only exist for Macintosh and Windows. No Unix client(s) exists that I know of. However, if you've got access to a command line, you can always try to telnet into the BBS rather than use the graphical client (more on this at the bottom of this page). The Windows File is self-extracting ZIP file, so put the "exe" into a folder before you double-click to extract it, then double click "setup" to launch the installer, while the Mac file is an HQX'ed Stuffit file. I'll assume you know enough about the internet to find and use the appropriate utilities to decompress these files and extract their contents to install and launch the application. This is the login screen. When you normally login, you enter your ID and your password and the server will read this and log you into the BBS. Note that the name you enter here for your ID is NOT YOUR SCREEN NAME -- it's just an ID, so it can be anything you like. It's only used to recognize you to the system, so make sure it's something unique. Enter the dynamic DNS name of techrat.is-a-geek.com into the field marked "Server" (where in the image, I have the IP as 68.36.96.186). This will assure that even if my IP has changed, Dynamic DNS will keep it up to date. In a pinch, I'll post my current IP# to the front page of "ObsolYte!" and you can use that if the DNS name doesn't work. 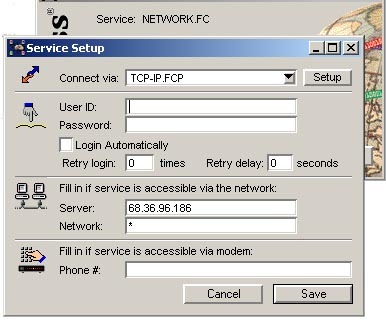 If you click on the "setup" button of TCP-IP.FCP, you'll see that you're set to connect to my IP at port 3000. This is VERY important -- the graphical client must be set to port 3000. I have port 23 open as well on my server, but that's for text/telnet logins to the BBS (more on that later). If you want to use a handle like "GrimReaper", then fill that out as YOUR LAST NAME and do not fill in a first name. 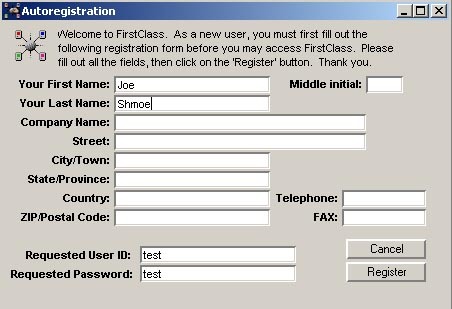 All other information is optional (as you see, I've filled out "Joe Shmoe" as a user. 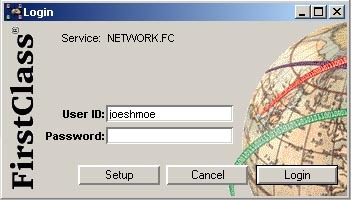 Because that becomes your screen name "Joe Shmoe" is how any message sent by this user will look like to the other users. Fill out as much as you like on this form and hit "Register". The system will confirm your ID and password, and then you'll get to the "Desktop", which contains six icons -- your personal mailbox (which contains every message you send or recieve through the system), a file area (where you can post and download applications and other stuff), "Street Talk" which seems to normally contain heated political debates, System Update, where I might occassionally post updates and other information about changes to the system, "help" which contain generic help files to get you used to using First Class, and "Obsolyte!" a conference created just for us. I've really been operating this BBS since 1993 -- but it only recently came into my personal posession, previously it was an email system for a company I worked for, so, you'll see a lot of legacy materials from my days at Vanguard Media. Feel free to mess around, you can't hurt the system. Open conferences, read messages, download files, post messages, have fun. It'll probably take you about an hour to really get used to using First Class, but after that it'll seem as natural as breathing. Many users can login simultaneously, so it won't be unusual to see someone else logged in (under the "service" pull-down menu, select "Who's Online" to see if other users are also logged in), and you can try chatting as well as other things. Have fun!!! The system is really cool and is my preferred way of "hanging out" online. One other way to connect to the BBS is without a client. Just telnet to techrat.is-a-geek.com and tap your return key twice. You'll be greeted with a login prompt for the First Class system. This allows you to go through the sign-up and participate in the BBS without using the graphical client software. When you login, type "help" and you'll be introduced to the system. The help feature is deep and useful as the command syntax is a bit arcane, but very full-featured. Feel free to use the BBS any way you like. It's here for your enjoyment.